You may purchase goods from your supplier in pack form, candles are a good example. You purchase candles from your supplier in packs, you then transfer these packs to your stores where they are then split into singles and sold. 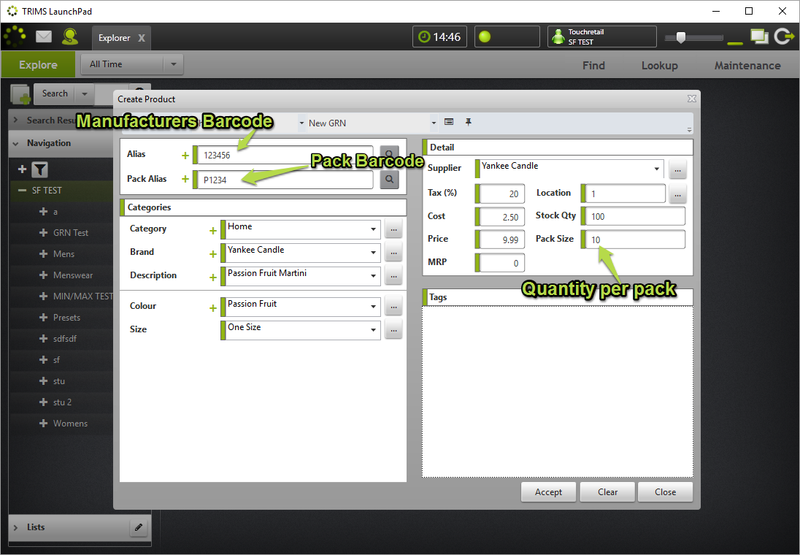 Packs usually have a pack barcode that differs from the actual item barcode, which when configured in TRIMS, allows you to receive orders and transfer items by packs. 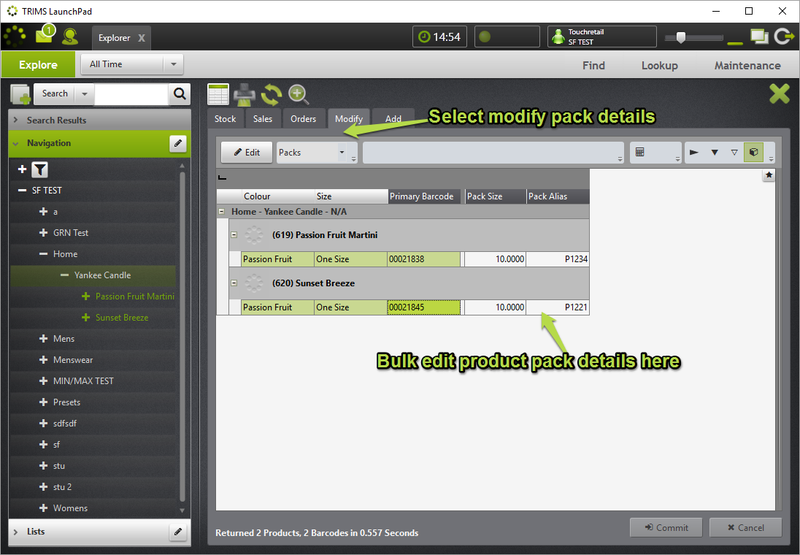 There are 3 ways to add pack details to your products. The first is at the point of creating a product, the second is by viewing and amending existing products and the third, by setting the pack quantity at a level in the navigation tree, which sets all of the items below it with the same pack quantity. By default TRIMS will automatically validate the single quantities entered against any pack quantities held on the products. If the figure entered is not a multiple of a pack, the quantity will be rounded to the nearest pack. Any rounded values will be highlighted in blue to notify you that the system adjusted this automatically. 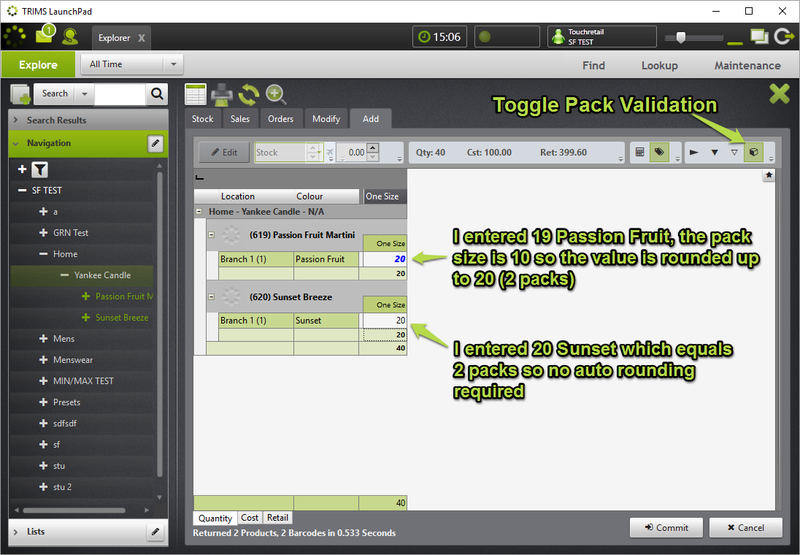 If you do actually want to order single values you can simply de-toggle the pack validation icon. The same pack validation also applies when printing labels that have pack quantities. This can be toggled as required. In the same way that quantities are validated against packs, transfers are also validated against packs and rounded as necessary. If you are using a HHT scanner then the scanner will accept pack barcodes which will be converted to singles when uploaded. However, the manual entry of quantities within the TRIMS stocktake app will not validate packs and therefore not round to the nearest pack. The cipherlab HHT is compatible with TRIMS pack barcodes, so if you use a HHT scanner for any of the above processes you can scan a mixture of packs and singles. Pack sizes and pack barcodes are available for mapping in product import templates, allowing you to import pack details in bulk.